I am happy to share this article that The Focusing Institute has published in The Folio. 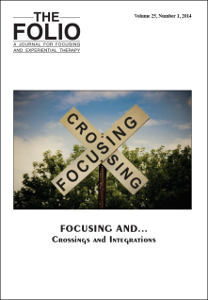 A Journal for Focusing and Experiential Therapy, its academic journal, in its volume 25 of 2014. My paper «Crossing Focusing and Nonviolent Communication. Reflecting for deeper implications« appeared at the beginning of 2014 and it has just been published digitally with free access and PDF format in the official website of The Folio. Download the article in English, «Crossing Focusing and Nonviolent Communication. Reflecting for deeper implications». Download the Spanish version of the article, «Cómo combinar Focusing y Comunicación Noviolenta. Reflejar para obtener implicaciones más profundas». Both Focusing and Nonviolent Communication (NVC) are based on the idea that people get insights and their inner processes get carried forward when some of their words are reflected. Reflection enhances connection both with oneself and with the companion. And reflection brings deeper implications, as implied aspects come into existence and become conscious. However, Focusing and Nonviolent Communication put the stress on reflecting different aspects of the original communication. Focusing follows felt senses in the body as a new way to create new meaning. Nonviolent Communication tries to find the universal needs that are at the core of every human action. Focusing and Nonviolent Communication have been crossed in different ways (a short revision of some crossings is explored in this paper). Focusing can be enriched by introducing a new awareness for needs, especially when Asking. And Nonviolent Communication can be enhanced by a new sensitiveness to the original expressions of the person –not just trying to “translate” everything, but also valuing habitual language as metaphors. When both processes are combined and the companion/therapist reflects aspects of both levels of awareness, the person achieves relevant results as deep implications emerge. Keywords: Focusing, Nonviolent Communication (NVC), Empathy, Reflect, Crossing. Para hablantes de español, ir a esta entrada en español.